ranges. This means that the sight picture will vary not only from one firing position to another but also from one firing line to another (fig. 11-25). TRAINING.You will receive training in aiming along with the position and trigger squeeze before actually firing on the rifle range. You do this by aiming at a series of small bulls-eyes at least 20 feet away on a dry firing range; this training is known as snapping in. BLACKENING SIGHTS.You should blacken the sights during sighting and aiming exercises to help eliminate light reflection or glare. Blacken all sights, both front and rear, on the base of the receiver and the top of the barrel. Usually, sights are blackened by using a smudge pot, carbide lamp, oily patch, candle, cigarette lighter, or ordinary match. Be sure to remove all oil from the sight before blackening it. Shooting Positions For the best results in rifle shooting, you need to shoot in the correct shooting position. The better the position, the easier it is to hold the rifle and squeeze the trigger while the sights are properly aligned on the target. However, shooting position wont compensate for lack of practice. You may have difficulty in assuming a correct position until sufficient practice has limbered up your muscles. Once your muscles are limber, you will find the positions both comfortable and steady. A standard qualification course requires you to learn and use three standard positions while shootingstanding, kneeling, and sitting. Experience has proved that these positions produce excellent results with men and women of all physical types. Once you master the correct positions, you must combine sighting and aiming with your practice. 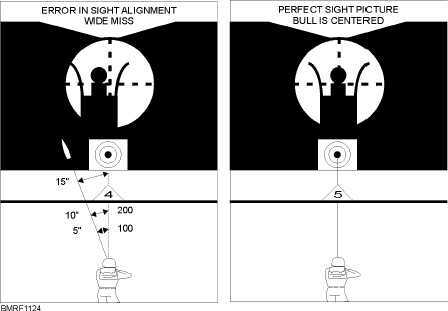 Learn to get into the correct position and align the sights without moving the rifle. If the target isnt properly aligned with the sights, you must move your body 11-17 Student Notes: Figure 11-24.Error in sight alignment increases as range increases. 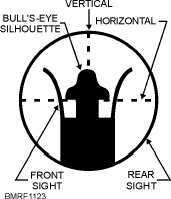 Figure 11-23.6 oclock sight picture held on a D target at a range of 200 yards.